Working with Year 6 on our World War II unit has been great fun. Alongside our Friend or Foe (Morpurgo) unit, the poetry has gone down an absolute treat with our pupils. There is literally so much that you can do with this unit of work and it was almost sad to see it come to an end. I'm just grateful I had the opportunity to see our pupils go through the emotions needed to capture the true importance of what it means for soldiers to fight for their country. We soon came to realise that war doesn't just affect the soldiers, but also takes on its own meaning for the wives and children who remain at home wondering if their loved ones will return. Please help yourself to the planning and resource ideas below and definitely check out the incredible video poetry that our Year 6's ended the unit with. Begin by introducing the unit and discuss the long term plan for the unit. Our focus for this unit will be on looking at the emotive language and the figurative language that draws us into the poem and helps us to ‘visualise’ the ‘imagery’ in our heads. We should feel as if we are there with the poet or with the people in the poem. Activity 1: children to go away and look at a range of poetry on their tables. Which do they like the most/the least? Why? Is there any language that is difficult to follow? What images are created in our minds as we read these poems? Activity 3: Finally, we are going to do some ‘word gathering.’ Set up an ‘Answer Garden’. Here the children are going to add any nouns, verbs, adjectives, adverbs that they can find in their poems. This will become a valuable resource in writing our own poetry- print off a copy for the Working Wall. This will be a treasure-trove of rich vocabulary. The video above, 'Beyond the Lines' was originally suggested by the Literacy Shed and although we only used this for one lesson, we could have easily adapted to use it for a whole unit of narrative writing. Such an exciting and emotive piece of animation. The main task will focus on children putting together their ideas from the video, to form short lines that can be put together to form a poem. Each pair is challenged to write an exciting sentence that relates to the video and includes at least one element of figurative language. Recap the elements of figurative language, then send the children away. Ask the children to come together with their sentence (written on a strip of paper) and place them one under the other to create a short emotional poem. Stick these up on the board with blu-tac. You might ask the children to help you re-order some of the ideas so that it makes more sense. Read the poem through- this becomes the model piece of writing. Now hand it over to the children to create their own piece. They can use some of the language from yesterday as well. Challenge the more able children to up-level their vocabulary choices. Ask pupils to read their final pieces through to their partner and then to the whole class if they are feeling more confident. hand and body gestures to bring a piece to life. Show the poem Dulce Et Decorum Est on the board and read it with the children. Hand out copies of the poem. As a class discuss the poem. Pick up on any language they don’t understand- chn to have this highlighted on their sheets ready for feedback. Discuss words they particularly like, what do they mean? Why do they like them? Why has the author chosen to use them? 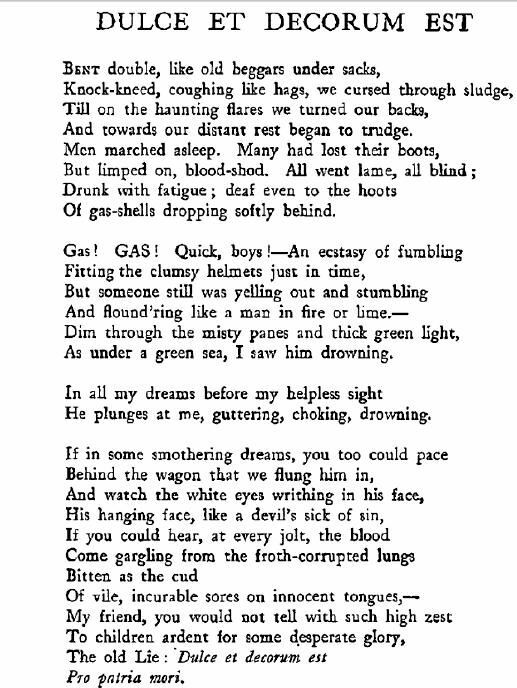 Have a general discussion about the mood created in the poem and how this is achieved asking questions such as- What image does it portray of war? How does it make you feel? How does the writer achieve this? What words does he use? http://www.warpoetry.co.uk/owen1.html This is a particularly helpful website which explains the poem very clearly. Main Task: Look at Dulce et Decorum Est in greater detail- children can use the website above and their partners to help them uncover some of the language that Wilfred Owen has used. Plenary: Then show the children the video ‘Dulce et decorum est poem and visuals’ on YouTube. Does this help you understand the poem? Why? Do they like it? Which of the two videos gives you a better understanding of the poem? Why? Are there still any unanswered questions that we have? Ask your class what makes a good poem. Elicit that it is language choices to create powerful imagery that achieves this. Main Task: Introduce the figurative language market place. Explain that on each table will be an envelope with various images inside. They must choose one and create a sentence using the sentence trick described at that table. They can use any of the resources on the table to help them, and especially the words on the board. When they arrive at the next table they must read the sentence that the previous person has written and try to do better. Glue their picture and their sentence to the master sheet before moving on. Review each tool at this stage, particularly AANVA and personification. You may also wish to discuss the difference between a simile and a metaphor. Plenary: return to their ‘home’ table and choose their favourite sentence as a table and share with the rest of the class. An important aspect of feeling the emotion of war, is to continually listen to the words of other poetry, but songs also carry their own meaning. In 2011, the Military Wives were brought together to create a piece for their husbands fighting in Afghanistan. How can I use language to communicate emotions as powerfully as possible? Children to generate lines of poetry using figurative language and then fit their ideas into a short form (WT) or a flexible style in books (WW and WB). Show the model on the board. 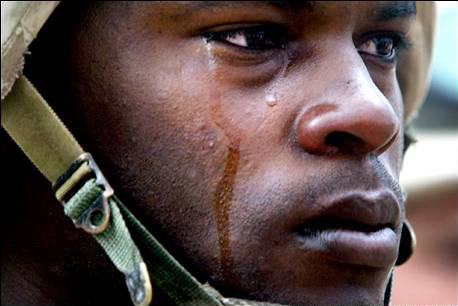 Children to focus on image of soldier crying – Children to generate lines of poetry using figurative language and fit ideas into a short form. The one stanza (verse) must be a ‘tear jerker’ that is going to elicit an emotional response from the reader using the words from the sentences from yesterday and our discussion today. Responses eg crying, pulse racing, goose bumps etc. Share your verse, whilst playing ‘sad piano’ music in the background. Children to grade 1-3 (‘I’m bawling my eyes out’, ‘I have a lump in my throat’ ‘I feel sad’ then stick on the wall in groups according to the grade. Discuss why it has been put in that group? What made you feel that way? Why did we play the music, what effect does the have on our emotions? Does how you read it have an impact? Who read their poem the best? How important is ‘performance’ to poetry? Following on from earlier in the unit, the children are going to prepare for the creation of their own World War Poetry videos. Remind them of the examples we looked at last week in the Dulce Et Decorum Est lesson. Watch them back again and whilst doing so, ask the children to consider a list of criteria that makes them successful. What should a good war poetry video include to make it successful? (Should create emotion- emotive music; should remind us of the horrors of war- some startling images used or suggested at, such as red backgrounds rather than really gory images) and so on. Put together a list of all the ideas the children came up with. During the lesson and after (at home), ask the children to prepare some music and some images to go with their poems- these will be useful today in creating a storyboard of what the video MIGHT look like. It doesn’t have to be perfectly identical in the end but should have many of the features. Children to complete the storyboard plan alone- use the internet to gather any images that haven't already been selected. remain sensitive to the men who have lost their lives. In no way should our videos down-play the importance of what thousands of men and women accomplished throughout the theatre of war. 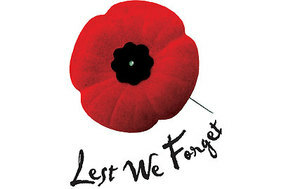 be aware of our audience- the best pieces could potentially be shown in an assembly to the school as a mark of respect ahead of Armistice Day on 11th November each year. The children should be given ample amount of time to sit and create using their storyboards, reviewing and playing back what they have achieved. They are going to need to record their voices on the video to play alongside the music and the images and some may even manage to add the subtitles of the specific part of the poem over the top as well. All the way through, remember to use a critical friend. Children to try out their videos on others in the class to gauge their responses- honesty will be required throughout to ensure that the best possible quality is achieved. If images need changing or replacing, or if the music isn’t appropriate then this will need amending. The final videos can be uploaded to See Saw, Dropbox, One Note and so on. This will be a two-part session. Part 1: Based on a three-form entry year group... please adjust accordingly. Each class in the year group will split their class into approximately thirds. One third will remain in the class and the other two thirds will go to the other two classes. When they arrive, they will be regrouped with someone not in their class (either pairs or threes). The children will then watch each other’s videos and complete an honest ‘peer assessment’ sheet that can be placed into the children’s books later on. Children to make sure they’ve seen each other’s and given at least one good aspect, one area for improvement and a rating from 1-10 on the ‘Emot-o-meter.’ (How emotional was it? )- Resource: use emojis! The children will return to the class where they will begin writing up their poem in neat onto plain paper using line-guides and so on. A copy of every poem will be placed in a Year 6 War Poem Anthology that each class will have in their classrooms. Teachers can choose to create a display out of individual work as well. I absolutely love this video, even if we didn't use it for this unit of work. In the future I think this could be used as a stand alone unit, just like the 'Beyond the Lines' piece, in much the same way, 'The Piano' has been taught in the past. The first video is the five minute version, whilst the second video is the half hour version if you have more time.